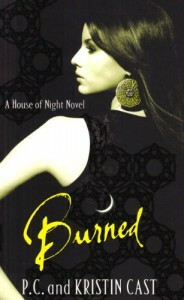 Burned (House of Night, #7) - P.C. and Kristin Cast - So many books, such little time. At the end of the previous book, Heath, Zoey's consort was killed by Kalona and because Zoey witnessed it and blames herself for it happening, her soul therefore shatters and is currently stuck in limbo. To get Zoey back to her original state it is all up to Stark with the help and guidance from the rest of the gang. In Burned, the Cast's have broaden their horizons. With the multiple threads of narrative, you get to spend more time with other characters rather than just Zoey. Also now that a bunch of characters have left the nest of Tulsa, the storylines are now set on an island off the coast of Italy (Neferet, Damien and the gang), an island near Scotland (Stark, Aphrodite and Darius) and then in the Otherworld following Zoey, Heath and Kalona. All of this adds depth to the story that was missing in the previous books. Although I hit an all time in book five, I do feel like it is improving a heck of a lot and I'm looking forward to the next instalment, Awakened.